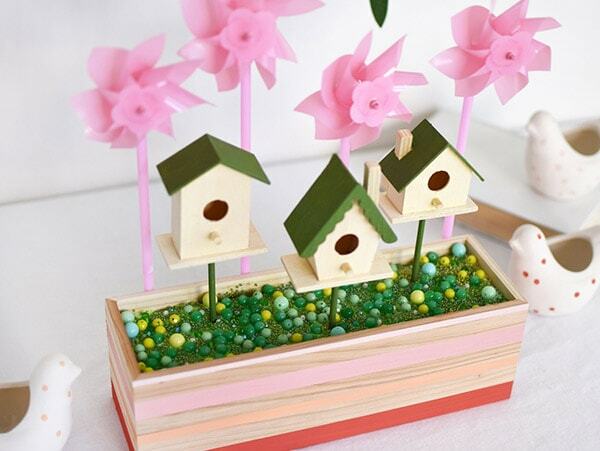 INSIDE : Learn how to make creative and colorful Spring Birdhouses. They are the perfect idea for Spring Decor on your tabletop, entryway or sitting out at your next party. I think someone told all the birds in our neighborhood that it is starting to warm up and they had better get to my backyard on the double. There seem to be endless birds flying around in our trees right now – which tells me, Spring is soon to be on it’s way! 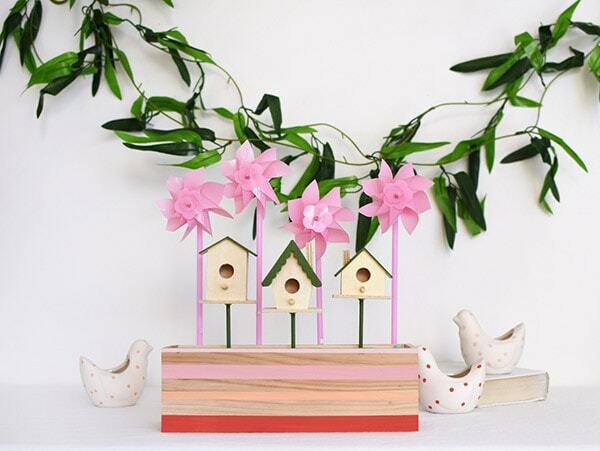 Today, I am sharing my adorable and full of cheer, Colorful Spring Birdhouses that I created for Oriental Trading’s FUN365 site. You just can not look at this festive birdhouses and not smile. 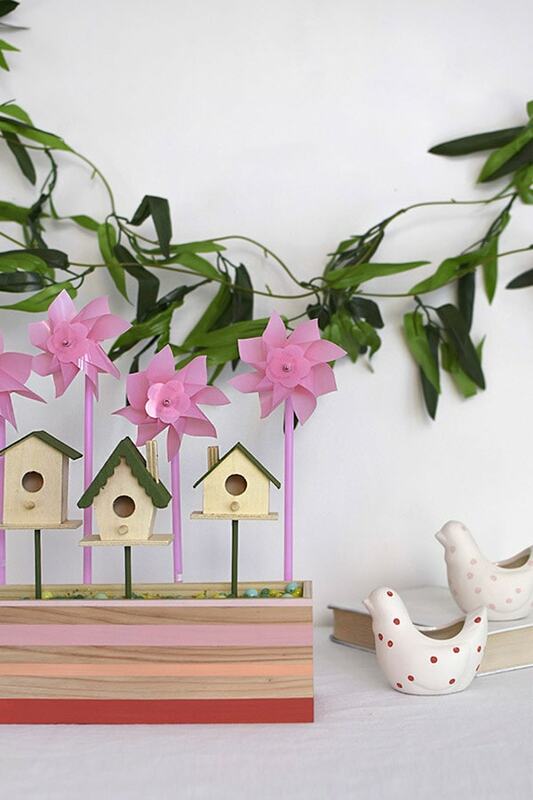 What supplies do I need to make this fun Spring Birdhouse Decor? 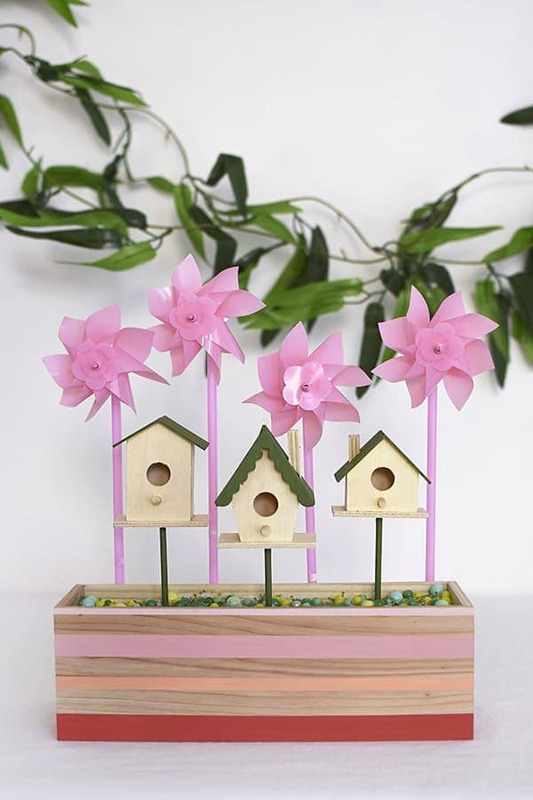 Be sure to head over to Oriental Trading’s Fun365 site to see my full step by step post and the complete supply list for these cutie birdhouses. Every single item in this project, even the photo props is from Oriental Trading Company! And when you take a peek inside my little wooden planter box, look what is sitting there ready to surprise you! A gorgeous assortment of different colored and different sized green beads. I love the little big of glisten and glam that the green beads brings to these simple wooden birdhouse display. And don’t forget, if you are looking for a fun craft to create this Spring season, be sure to head to Oriental Trading’s Fun365 site for more information and the full tutorial! Plus, there is nothing that brings children more simple joy than a box of pink pinwheels arriving on your door step – believe me, I know this for a fact. I also may have really enjoyed playing with them for a bit before using them in my simple DIY birdhouse ideas project. And if you are curious to check out all my Oriental Trading projects, you can head over here! How adorable! It’s making us excited for spring!